Drysuit diving, heard of it? Interested in it? Have no idea what it is? Well, we are here to let you know everything you need to know about drysuit diving and how you can get started - by the girls that know the best, the GTS army! Written by Suzie a Girls that Scuba service technician. What is Dry Suit Diving? As most divers will know, water conducts heat away from the body at least 20 times faster than in air. So when diving in cold water (we'd suggest anything below 21 degrees) we must use the correct exposure suit in order to achieve a comfortable dive and protect ourselves from hypothermia. A dry suit does exactly this. It keeps water out and by using a layer of air around the body it also keeps us warm. Why go Dry Suit Diving? It’s not always easy to get to those exotic destinations we dream about diving in so sometimes we have to go with what’s local to cure our bubble-blowing cravings - and local sometimes mean cold! However, there are some fantastic dives around the world from the Arctic to Antarctic that can only be reached in a dry suit and by learning this new skill it opens up diving all year round and anywhere in the world. Dry suit Diving in the UK offers everything from diving with seals in the Farne Islands to wreck diving in Scapa Flow, from being with basking sharks in Oban to Shark Diving in Deep Sea world. Yes, you do need training when diving in a Dry suit. Dry suits are another piece of equipment to think about whilst diving and so you must learn how to use them correctly in order to have a safe and fun dive. They can be used for buoyancy control and require more weight to be added as they are much more buoyant than a wetsuit, there are also safety issues you need to take into consideration. For this reason, it is strongly recommended that you complete a dry suit orientation dive in a confined environment with a certified professional. We would also recommend completing a dry suit specialty course which consists of a confined session and two open water dives getting comfortable with your dry suit. This is a fun and fairly straightforward course that can be done in one or two days. Lots of people will give you information on types of suits but not enough people give you advice on how to try them on. When going to buy/rent a suit, wear what you are going to wear under the suit on a dive. We love Fourth Element Ladies Arctic set but you can get many different types of undersuits: from thick quilted onesies aimed at the trilaminate suits to thin ones complementing the neoprene suits. So with your undersuit on, open the dry suit and hold the waist from the inside, more often than not there will be shoulder straps so get them out of the way. Sit down if you can and put both feet in and stand up. Pop the shoulder straps on and adjust to your comfort. Now if you are donning a suit with latex seals I recommend you put some talc powder around your wrists and into the seals this will help glide them on. We tend to suggest putting both hands in at the same time and stretching up for them to hopefully slide on. For neoprene seals you will need something a little more gloopy so as not to damage the seals, we recommend O’Three Jollop for this. A small squirt in each seal will help loads. Next, it’s the neck seal and, as many instructors I know say, it feels like being born again! With both hands hold the neck seal on the outside and stretch slightly and pull up and over and push your head through. You must take out all of you hair from the neck seal or it won’t be watertight and will be uncomfortable for you. Ladies with long hair – tie it up. Now if you have a latex neck seal make sure it is flat against your neck and tight enough to keep water out but not enough for it to be uncomfortable or restricting anything. (If your face turns red take it off!) Neoprene neck seals are much longer for a reason and need to be folded in on themselves in order to make a seal with your skin. At this point ask a friend to zip up the shoulder zip making sure it is completely closed. To complete the job and get the right feel for the suit you should also place one finger into the neck seal of your suit and bend down to the ground and give yourself a hug: this lets out all the trapped air in the suit. Let go of the neck seal and stand up – you will be shrink-wrapped and ready to go. What to consider when purchasing a Dry suit? Dry Suits are expensive pieces of equipment so it is important to consider a few things when choosing to purchase your own. There are many different dry suit materials (neoprene, crushed neoprene, vulcanised rubber, trilaminate) but nowadays for recreational dry suit diving there are 2 main types; neoprene and membrane/trilaminate. Trilaminate is made up of three layers as the name suggests and will keep you dry but does not give much insulation. Cordura or membrane types are particularly robust and are often used as school suits for this reason. These have a generally looser fit on the body to allow you to add more insulation underneath. Neoprene is thicker and has better insulating qualities than a trilaminate suit so will keep you warmer with minimal undersuit. It is a much more fitted suit and we find it much easier to move in, but it is easier to damage/puncture. When choosing a suit it comes down to personal preference, as we found after learning in a membrane suit we quickly jumped to our own neoprene suit as soon as we could afford it and loved the warmth and freedom of movement. Our best advice would be to try them on. Most shop staff will be happy to help and have a wealth of knowledge to help you decide. Other than the material there are three main suit components that help keep you dry; neck and wrist seals, dry zip and valves. They are 2 types of seals; neoprene (mainly found on the neoprene suits) and latex (mainly found on membrane/trilaminate suits) the latter of which can cause allergies and so some companies are turning to the more comfortable neoprene alternatives. The neoprene seals can also be made to measure by a technician. The main purpose of the seal is to keep the suit watertight and so these should be a snug fit but not uncomfortably tight. The dry zip comes from a design used on space suits. It is very important and is the most expensive part of your suit to replace - so take care of it! (Wash with fresh water and keep lubricated) There are front entry zips, U-zips and shoulder zips. There are also pee zips but these won’t be useful to us females unless you have the use of a she-pee! Please note pee zips are for surface use only! A dry suit will have an inflator at the front of the suit which connects to a low-pressure quick release hose on your regulator. This is used to insert air into your suit to give you warmth and also for buoyancy control. Dry suits also have an air dump which will either be a shoulder or a cuff dump. These allow you to dump air in order to control buoyancy. To use these correctly it is best that you seek a lesson from a professional. Other options to consider are boots or socks. Some suits come with socks and you can wear rock boots or wetsuit boots on top and if any damage occurs it will cost you less to replace a pair of wet boots than it would to replace the boots on your suit. Suits can be altered to help make them a better fit for an individual. For example changing cuff and neck seals both latex and neoprene, changing boot sizes. Repairs and replacements can also be made and I would urge you to have these done by a certified professional as your dry suit is an important piece of equipment to keep you safe. DON'T FORGET to remove earrings and rings etc that may tear drysuit seals as they can get caught when donning and doffing the suit. Most of the larger brands have realised there are more and more lady divers out there who don’t fit perfectly into a male sized suit. So they are now providing female sized suits. Some of these include: Scubapro Everdry 4, O’three customised suits, Typhoon Seamist, Seac Warmdry and more. Here are some our GTS girls recommend. Highly recommended by our drysuit GTS experts. O’Three has built its reputation on neoprene dry suits and are staunch believers in neoprene and the additional benefits it offers over other types of material. Developments in technology and techniques means that the depths and run times being achieved today are quite simply staggering. Neoprene is being taken into new territory. 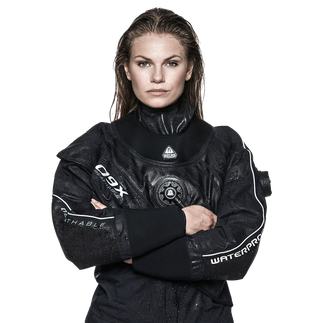 If you're in the market for a drysuit you are going to want to check them out. The EVERDRY 4 offers the streamlined fit, comfort and flexibility of a wetsuit, with the thermal properties and water-tightness of a drysuit. It is constructed of 4mm high-density neoprene sandwiched between layers of nylon jersey -- the heavier outside layer is designed to withstand abrasion, the lighter inside layer is more for comfort. Recommend by many of our GTS girls Otter Watersports has always been quality driven, with each suit receiving a unique number to allow quality to be closely monitored through out its manufacturing process. Each suit is made by just one person, where traceablity ensures constant quality. With each suit being pressure tested for 12 hours without loss of pressure, there is no such thing as a nearly dry Otter Dry Suit. Otter has achieved C.E. approval for all its suits. The Seac Warmdry Women's Drysuit is a 4mm compressed neoprene drysuit with a semi flexible boot, braces and a thigh pocket. High grade materials and flexible ankles make this suit extra comfortable no matter your diving style. Coming in at £550 (RRP £628) its almost half the price as some others. Our contributor Suzie was lucky to have completed her Open Water Course in a Dry Suit and she would encourage those especially in the UK to learn there as they have some fantastic sites and it means you get the best of both worlds from the very beginning of your scuba diving journey. To all the holiday divers out there, give the dry suit a shot, we are more than sure you will be pleasantly surprised by what the coldwater diving scene has to offer - and the buddies you will make who share your passion will be priceless. A Scottish PADI Diving Instructor and Service Technician with a passion for marine life, conservation and education.